Biography of Norwegian Expressionist Painter and Printmaker. Norwegian artist Edvard Munch was a key forerunner of the Expressionism movement. Closely associated with Symbolism and Symbolist painting, he is best known for his images of anxiety, isolation, rejection, sensuality and death, many of which reflected his neurotic and tragic life. Deeply influenced by symbolists like Odilon Redon (1840-1916), as well as other pioneering expressionists like the Dutchman Vincent Van Gogh (1853-90), Munch was also briefly a member of Der Blaue Reiter (Blue Rider) - a Munich group of artists involved in German Expressionism, established by Wassily Kandinsky (1866-1944) and Paul Klee (18791940). 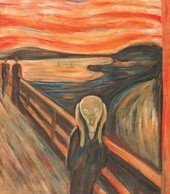 Munch's most famous painting is the Scream (he painted several versions), which remains one of most recognizable images in the history of art. His other notable works include: The Sick Child (1885), Madonna (1895), Ashes (1894), and The Dance of Life (1899) all in the National Gallery Oslo; Love and Pain (Vampire) (1893, Munch-Museet, Oslo), Starry Night, (1893, Paul Getty Museum, LA) and The Sick Child (1907, Tate Collection, London). Born in Loton, Norway, Munchs father was a doctor. When Munch was five years old, his mother died of tuberculosis, a disease to which his elder sister succumbed a few years later. Perhaps due to these early events, death became an integral part of his future art: the dying profile against a pillow, the wretched mother at the bedside, the muted light, the lifeless glass of water. His father remained an authoritarian figure, and repeatedly told his children that if they sinned, they would be doomed to hell without mercy. As it was, the family did suffer greatly. One of Munch's younger sisters was diagnosed with a mental illness at an early age and Munch himself often felt ill. Of his five siblings, only one married, but even he died within a few months of the wedding. In 1881 Munch joined the Royal School of Art and Design in Kristianind and took modelling and drawing lessons. His teachers and early influence were the Norweigan sculptor Julius Middelthun and naturalistic painter, author and journalist Christian Krohg. Although Munch painted traditional subjects as a student, like landscapes, he was quickly discovering his own unique style. In 1882 he rented his own studio with a couple of other artists. Not many of his works from this time remain, but one example is Morning (1884, Rasmus Meyers, Bergen). For much of the 1870s, Berlin, Munich and Paris were centres of innovation for artists, but by the 1880s, Paris was by far the most favoured home among serious art students. In 1885, the 22 year old Munch made his first trip to the French capital. He stayed for three weeks absorbing the works of the French Symbolists. When he returned to Oslo, he worked on his first major paintings that would establish his reputation. These were several versions of The Sick Child, based on the death of his 15-year-old sister from tuberculosis. His style of painting style was sketchy, unfinished-looking, using scrubby paint (with scratch marks from the handle of the brush). He had a rare ability to portray inner emotions in a universal way, so that we can recognise our own inner fears, as well as being able to connect to his. Munch carefully composed his compositions to create a tense atmosphere. He was briefly associated, as a result of these works, with the Christiania-Boheme art circle, named after a novel by the anarchist Hans Jaegar. During his early period, he was influenced by the Symbolism and Impressionism movements, and especially by the expressive works of Van Gogh (1853-1890), Paul Gauguin (1848-1903) and Toulouse-Lautrec (1864-1901). It was around this time that his personal neurosis came to the forefront, particularly in relation to women. Although he pursued them incessantly, they constantly rejected the somewhat strange and sickly artist. He often depicted women seemingly sucking the lifeblood out of men with a kiss. He painted characters with strange flesh colours and he had an obsessive interest in eyes and eye sockets, supposedly a phallic symbol. In the 1890s he worked on his major works entitled Frieze of Life, a series of six paintings, which explored love, anxiety, life and death. He wrote "We should no longer paint interiors with men reading and women knitting. We should paint living people who breathe, feel, suffer and love". In 1892, he gained notoriety when he exhibited some of his paintings at the Verein Berliner Kunstler show. There was so much passion and pain in his works that the art establishment deemed them unsuitable for public display. They said his images were terrifying and threatening. (For more about Munch's German period 1892-5, see: Post-Impressionism in Germany c.1880-1910). 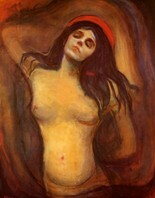 However, painting was the only way Munch could express the pain and the loss he had suffered over the years. He was a true Expressionist. Other notable works from this time (all in the National Gallery of Art, Oslo) include Vampire (1893), Ashes (1894), Madonna (1895), Self-Portrait with Burning Cigarette (1895), Death in the Sickroom (1895), and The Dance of Life (1899). Another painting, Dead Mother (1899) is in the Kunsthalle, Bremen. In 1908 Munch suffered a nervous breakdown, compounded by excessive drinking. He entered a clinic and for the next 8 months was treated with a special diet and electrification. When he returned to oil painting, his works became more colourful and less pessimistic (though many art critics believe he painted his best works before 1908). The following year, as well as joining the Blue Rider expressionist group in Munich, he had an important solo exhibition, where he exhibited over 100 oil works and 200 prints. He carried this show to America in 1915, and was awarded with a gold medal for his graphic art. He also produced a number of mural paintings for Oslo University, as well as a significant number of graphic works, including numerous examples of lithography. Now established as one of the top modern artists in Europe, he was financially successful enough to help other young artists. He continued to take his works around the world, and one of his most comprehensive shows was at the National Galerie in Berlin where he exhibited over 200 oils. But he continued to be dogged by death. In 1926, his sister Laura died and a few years later so did his beloved Aunt Karen Bjolstad. During the Nazi years in Germany, his works, along with those of many other Expressionist painters, including Paul Klee (18791940), Oskar Kokoschka (1886-1980), Max Beckmann (1884-1950), Ernst Ludwig Kirchner (1880-1938), Kurt Schwitters (1887-1948), Marc Chagall (1887-1985) and many others were labelled 'degenerate art' and removed from German and Norwegian museums. He was deeply upset as he considered Germany his second home. He continued to work until his death in 1944, at the age of eighty. He bequeathed all of his work to the city of Oslo, comprising over 1,000 paintings, 15,000 prints and 4000 drawings and watercolours. In 1963, The Munch-Museet (Museum) was opened in Oslo to house all his work. (He also became the first Western artist to have his pictures exhibited at the National Gallery in Beijing.) In 2004, Munchs paintings The Scream and The Madonna were stolen from the Museum by armed robbers, but were recovered by police in 2006. In addition to the Munch-Museum and the National Gallery of Art in, Oslo, paintings and prints by Edvard Munch hang in the best art museums across Europe.  For more biographies of expressionist artists, see: Famous Painters.  For information about lithography and other methods of printmaking, see: Homepage.